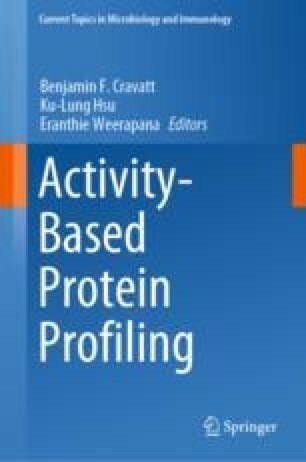 Activity-based protein profiling (ABPP) is a technique for selectively detecting reactive amino acids in complex proteomes with the aid of chemical probes. Using probes that target catalytically active enzymes, ABPP can rapidly define the functional proteome of a biological system. In recent years, this approach has been increasingly applied to globally profile enzymes active at the host–pathogen interface of microbial infections. From in vitro co-culture systems to animal models of infection, these studies have revealed enzyme-mediated mechanisms of microbial pathogenicity, host immunity, and metabolic adaptation that dynamically shape pathogen interactions with the host. We gratefully acknowledge Pamela Chang, Joshua Gendron, Yannick Jacob, and Lindsay Triplett for providing helpful feedback on this manuscript. Y. K. was supported by an NIH Predoctoral Training Grant (T32GM067543).